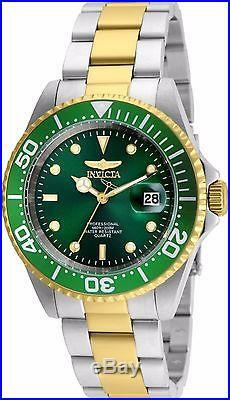 24950 Invicta Pro Diver Quartz Men's 40mm Green Dial 2 Tone SS Bracelet Watch. Stainless steel case with a two-tone (silver-tone and gold-tone) stainless steel bracelet. Green dial with gold-tone hands and index hour markers. Minute markers around the outer rim. Date display at the 3 o'clock position. Scratch resistant flame fusion crystal. Fold over with safety release clasp. Water resistant at 200 meters / 660 feet. Functions: date, hour, minute, second. Invicta Pro Diver Green Men's Watch 24950. Collection: Pro Diver -------------------------------------------------- Series: N/A -------------------------------------------------- Product Family Code: PF9835 -------------------------------------------------- Band Material: Stainless Steel -------------------------------------------------- Band Tone: Steel, Gold -------------------------------------------------- Band Size [mm]: 20 -------------------------------------------------- Band Length [mm]: 205 -------------------------------------------------- Bezel Color: Green -------------------------------------------------- Bezel Material: Stainless Steel -------------------------------------------------- Buckle Type: Diver -------------------------------------------------- Case Material: Stainless Steel -------------------------------------------------- Case Tone: Stainless Steel, Gold -------------------------------------------------- Case Size [mm]: 40 -------------------------------------------------- Crown Type: Push -------------------------------------------------- Crystal: Mineral -------------------------------------------------- Dial Material: Metal -------------------------------------------------- Dial Color: Green -------------------------------------------------- Function Type: Quartz -------------------------------------------------- Gender: Men -------------------------------------------------- Luminous Material: Tritnite -------------------------------------------------- Luminous Color: Light Green -------------------------------------------------- Movement Caliber: PC32A -------------------------------------------------- Movement Components: Japan -------------------------------------------------- Movement Jewels: N/A -------------------------------------------------- Movement Origin: Japan -------------------------------------------------- Movement Vendor: TMI -------------------------------------------------- Swiss Made: N/A -------------------------------------------------- Number of Stones: N/A -------------------------------------------------- Type of Stones: None -------------------------------------------------- Case Thickness: 12 -------------------------------------------------- UPC Code: 886678301744 -------------------------------------------------- Water Resistance [m]: 200 -------------------------------------------------- Weight: 139. The item "24950 Invicta Pro Diver Quartz Men's 40mm Green Dial 2 Tone SS Bracelet Watch" is in sale since Monday, July 24, 2017. This item is in the category "Jewelry & Watches\Watches, Parts & Accessories\Wristwatches". The seller is "roshaanwatches" and is located in Garland, Texas. This item can be shipped to United States, Canada, United Kingdom, Denmark, Romania, Slovakia, Bulgaria, Czech republic, Finland, Hungary, Latvia, Lithuania, Malta, Estonia, Australia, Greece, Portugal, Cyprus, Slovenia, Japan, Sweden, South Korea, Indonesia, Taiwan, Thailand, Belgium, France, Hong Kong, Ireland, Netherlands, Poland, Spain, Italy, Germany, Austria, Israel, Mexico, New Zealand, Philippines, Singapore, Norway, Saudi arabia, Ukraine, United arab emirates, Qatar, Kuwait, Bahrain, Croatia, Malaysia, Brazil, Chile, Colombia, Costa rica, Panama, Trinidad and tobago, Guatemala, El salvador, Honduras, Jamaica, Antigua and barbuda, Aruba, Belize, Dominica, Grenada, Saint kitts and nevis, Saint lucia, Montserrat, Turks and caicos islands, Barbados, Bangladesh, Bermuda, Brunei darussalam, Bolivia, Ecuador, Egypt, French guiana, Guernsey, Gibraltar, Guadeloupe, Iceland, Jersey, Jordan, Cambodia, Cayman islands, Liechtenstein, Sri lanka, Luxembourg, Monaco, Macao, Martinique, Maldives, Nicaragua, Oman, Pakistan, Paraguay, Reunion.